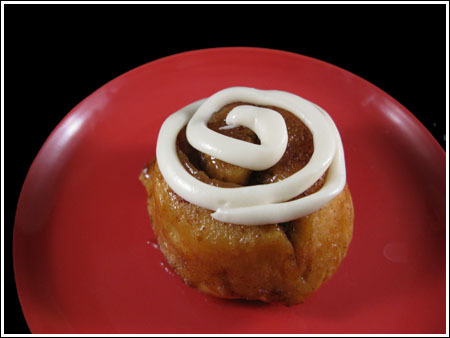 This is one of my older cinnamon roll recipes, but I still like it for a few different reasons. First, it calls for instant yeast, which is typically what I have around. Second, it makes a dough that’s easy to roll and not too sticky. And finally, the cinnamon rolls taste great! 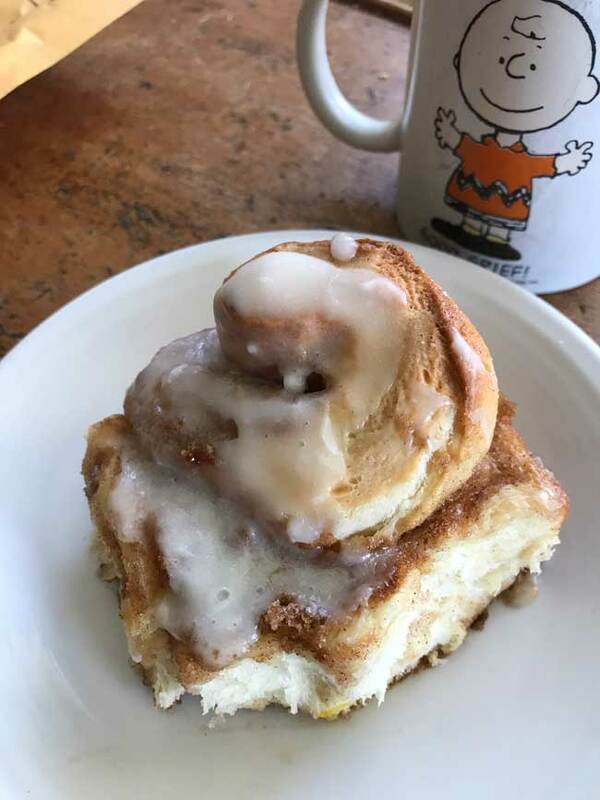 The original version of the recipe is called Ninety Minute Cinnamon Rolls and it’s interesting in that the dough is placed in muffin cups rather than just sliced and baked. When I first made this recipe I used the muffin cups, but these days I just cut the slices and lay them in a large pan. Here’s a photo of the sliced dough in a 9×13 inch pan, along with what it looks like after being baked. Heat the milk in a small saucepan until it bubbles; remove from heat. Mix in butter; stir until melted. Let cool to lukewarm. Alternatively, you can heat the milk in the microwave-safe measure for about 1 minute, stirring every 30 seconds, and add the butter to the hot microwaved milk. Combine 2 1/4 cup of the flour (280 grams), yeast, sugar and salt in a large mixing bowl; mix well. Stir in water, egg and the milk/butter mixture. Add the remaining flour, 1/2 cup at a time, stirring well after each addition. When the dough has just pulled together, turn it out onto a floured surface and knead until smooth, about 5 minutes (I do this all in the stand mixer using the dough hook). Cover the dough with a damp cloth and let rest for 10 minutes. Meanwhile, in a small bowl, mix together brown sugar, cinnamon, softened butter. Roll out dough into a 12x9 inch rectangle. 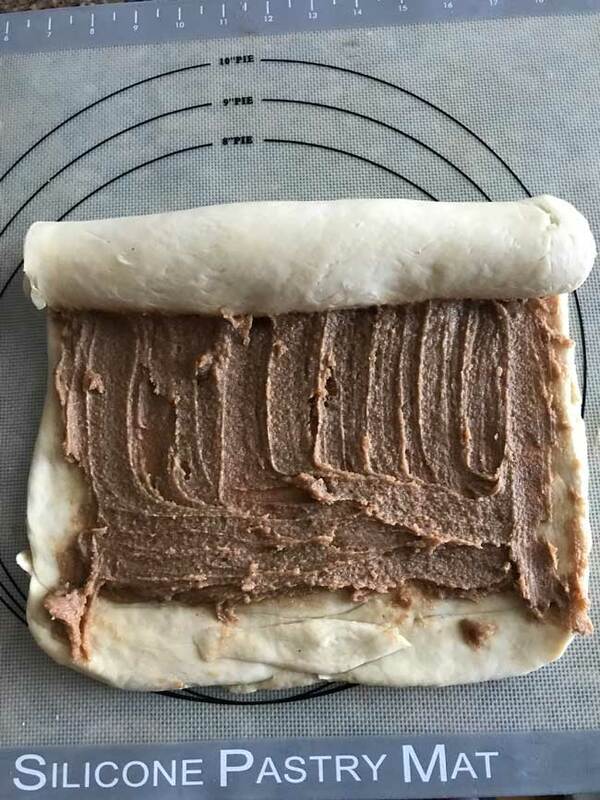 Spread dough with butter/sugar mixture. Roll up dough (from the short side) and pinch seam to seal. Cut into 12 equal size rolls and place cut side up in 12 lightly greased muffin cups (or in a well greased 9x13 inch pan). Cover and let rise until doubled, about 30 minutes. Preheat oven to 375 degrees F (190 degrees C). Bake in the preheated oven for 20-25 minutes, or until browned. Remove from muffin cups to cool. Serve warm or let cool and frost with icing (or put the icing on while warm and spread it). Stir together melted butter and powdered sugar to make a thick pasty like substance. Stir in the cream cheese. Add milk, one tablespoon at a time, stirring until you get a consistency that seems conducive to putting on cinnamon rolls. Stir in the vanilla. Here’s an older photo of ones made in a muffin cup. Thanks for the review, Cheryl. Sorry that happened. Next time I make these I will try to troubleshoot and figure out what went wrong. That being said, there’s nothing wrong with the tried and true method. I just thought this one was interesting at the time and I liked the results. BTW, did you use instant yeast? I’m wondering if maybe you used regular fast rising yeast rather than instant. Having had recent success in making home-made hamburger buns, I thought I’d turn my hand to everyone’s have – cinnamon buns. Was VERY disappointed in the physical results from this recipe. Using a muffin pan gave me buns that rose up out of the cups beautifully but when baked rose up even higher and became hollow in the centre, causing the cinnamon filling to drip into the bottom of the cups. I ended up with buns that looked more like Yorkshire Puddings than cinnamon buns. I think next time I’ll stick with the tried & true method of using a cake pan. That way, I’ll be able to invert the pan onto a plate and the filling will stay intact. Hi Anna! Just a quick question. What is the equivalent of a .25 ounce packet of instant yeast in, say, teaspoons? I just bought a relatively large pack – it didn’t come in packets! Gosh, I hope I bought the right one! Hope this isn’t too much to ask! More power to you! LOVE your blog! Since I use a lot of yeast, I buy the vac sealed bags for 5.50. You get like 50x the amount in the small packets. Its called instant yeast or rapid rise. They’re basically the same thing, they dont need to be proofed before adding them to the flour. Regular yeast needs to be proofed in water and some sugar( is that the kind you use). Also, you use 3/4 tsp of instant or rapid rise in place of 1tsp of regular yeast. Randi, maybe I’m making it more confusing. I am referring to “fast rising” yeast when I say instant yeast. Is that the type you use? I always use the type of yeast that comes in small packets, but the type I use is regular rising rather than “fast rising”. Also, this is probably the same recipe you used off allrecipes.com. Just curious, why would you use regular yeast? I like instant so much better. 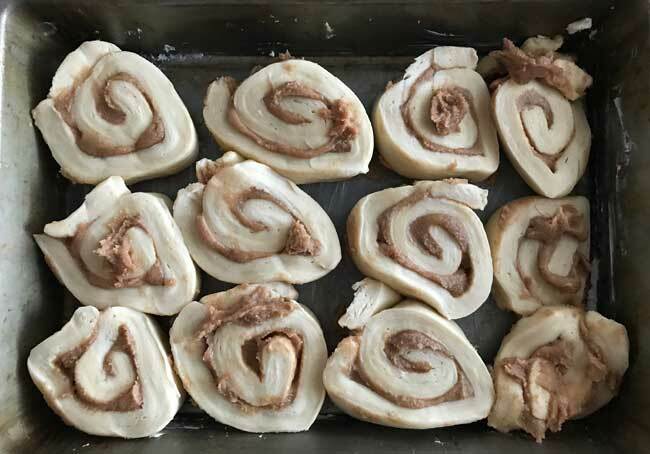 I made a cinn roll recipe from AR, that was baked in a muffin tin. It was 90 min cinnamon rolls. They were good right away, but not too good 1 hr later. It’s been a long time since I have made yeast breads- yeast doesn’t intimidate me, but cinnamon rolls and sticky buns do. These look fabulous! I will tackle cinnamon rolls one of these days! I love cooking with yeast. I even like the smell of it. The outcome isn’t that shabby either. Nothing like the aroma of fresh bread or rolls baking. You can’t bottle that or put it in a candle either. Back to good ol’ home cooking is what I say! I keep my dark bottle is the freezer. 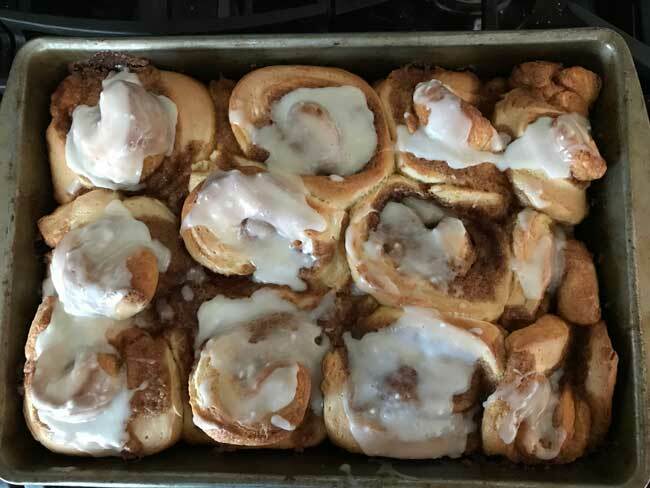 I’m terribly intimidated by baking with yeast, but those cinnamon rolls look awfully delicious!!! Please give Lizzie an extra hug for me, and cherish her (you’ll see why, if you see my current post).